Now that R&D Interface, Medium and Keyhole are rotating, this suddenly looks a lot more appealing as a pseudo-multiaccess replacement for the aforementioned. 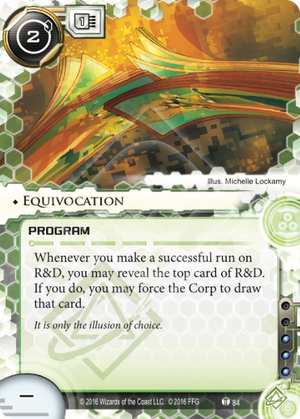 Equivocation gives you the option of sending the top card of RnD into the corp's hand and try your luck on the second instead. The benefit of this is twofold, both upping the chance of finding something you want to steal or trash and mitigating the risk of running into traps like Snare!, News Team or Breached Dome. The downside is that if the top card is an agenda or something you can't let into the corp's hand, you don't get any second access. Further, the effect can be very nice for the corp- a free certified non-agenda draw is great under most circumstances. This card, as a part of the Dyper series of Netrunner for One™ (DDoS, False Echo, Keyhole, and Hyperdriver with potential The Turning Wheel or Hades Shard for garnish), means that the milling machine is twice as fuel efficient as before! Embrace the worst way to play this game and be so smart for playing the "solved" version of this dueling card game revolving around economy, attacking and defending! I'm so salty that this card suite exists and that people have the gall to play this way. Just go play Solitaire and cheat if you want to win a single-player card game so badly. For everyone who doesn't want to be a part of this disgusting blight on the game, pull out the ol' FA tricks (or a single lucky Accelerated Beta Test) to end the game before this Icebreaker-free deck revs its awful engine. Very elegant to include this into a Maw and/or Alice deck, as some corps will try to empty their hand on their turn. This card alone will put excessive pressure on the corp's R&D forcing considerable amounts of ICE to be spent and rezzed.